For the last several weeks, Adam’s been threatening to kill Vicki if he doesn’t get his way. At press time, he hasn’t gotten his way, so it’s probably best if he just kills her now, and then we can all move on. So he sneaks into her room while she’s sleeping, and just reaches out and strangles the life out of her. She doesn’t scream, or even struggle very hard. She just kind of sighs and breathes heavy for a second, and that’s it. Vicki was an idiot. So, that’s that; the Collins family is now minus one governess. I guess they’ll have to put an ad on Craigslist or something. I mean, there is obviously no way that she could have survived this attack. Adam is an enormous Frankenstein creature; it’s been established that he can bend steel bars just by giving them a stern look. Even for a soap heroine, there’s no way that Vicki could maintain structural integrity under these circumstances. She’s just not built for it. It’s quite a grisly little scene, actually, because it happens so quickly. She doesn’t really get a chance to react. She was sleeping, and then Adam put his hands around her neck, and now she’s dead, and she doesn’t even know what’s going on. 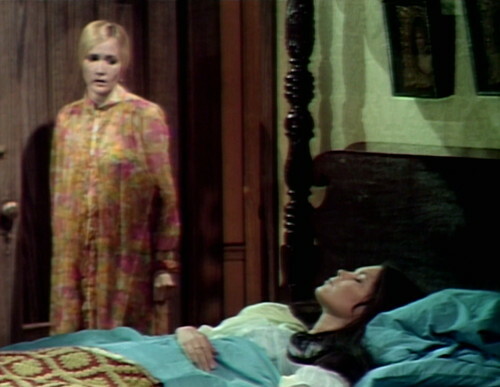 Alarmed about Adam’s intentions, Barnabas rouses Carolyn, and they pile into Vicki’s room to perform whatever the opposite of first aid is. They find her lying on the bed, freshly strangled, and the first thing they do is pick her up by the shoulders and jostle her into a more pleasing visual arrangement. This is going to do wonders for her spinal cord injury. 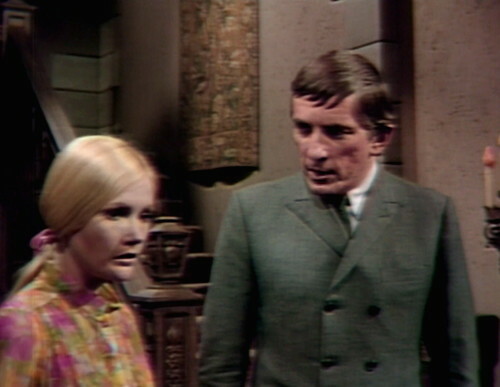 Carolyn hurries off to fetch Julia, and Barnabas looks off into space and has a little thinks monologue on the subject of whether this is his fault or not. They still haven’t checked Vicki’s vitals, by the way. I guess they never really liked her that much in the first place. Carolyn goes downstairs to call the police, but she’s interrupted by Nicholas, the Satanic wizard who isn’t staying at Collinwood anymore, and should really have a better reason for why he’s hanging around in the foyer, getting in the way of emergency services. Carolyn tells him about the attack, and says that Adam’s out of control. They’re about four assaults in on Adam’s attempted-murder spree, and it’s probably a good idea to get the monster out of the house before he breaks somebody that we like. But Nicholas has recently signed on as Adam’s agent, and he provides an alibi, claiming that he and Adam were playing chess together for the last two hours. Carolyn instantly believes Nicholas, and fair enough — she doesn’t know any reason why he would lie. But that means there’s still a killer loose inside the house, and she doesn’t seem particularly interested in identifying any other suspects. As far as she’s concerned, if it’s not Adam, then it must have been some kind of misunderstanding. By the time Carolyn returns to the scene of the crime, Julia’s already been and gone — the invisible off-screen soap doctor who doesn’t actually appear in this episode. 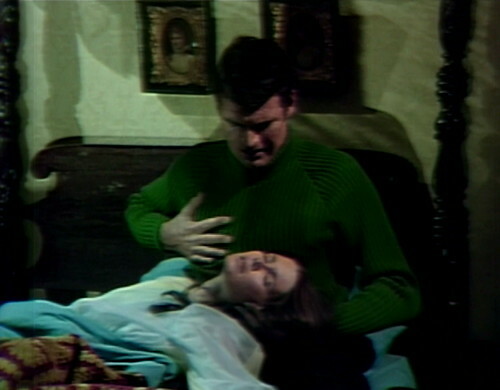 Barnabas tells Carolyn that Vicki’s alive, but she’s in shock. I am too, actually; our lame Frankenstein monster can’t even kill a governess at point-blank range. He doesn’t really know how to make a getaway, either; he just goes upstairs to his room and sulks. This is not a high-quality monster reaction. I guess the audience is still supposed to think that he’s conflicted about violence, so that he can maintain his status as a character that we care about, but it’s not an easy sell. Adam’s whole shtick used to be that he didn’t realize what he was doing when he lost his temper, but they’ve been riding that horse for so long that it’s collapsing under the weight. Two weeks ago, Adam started playing chess, which was a remarkable moment where they tried to leave the old Frankenstein cliches behind. But Nicholas is supposed to be the real mastermind behind this operation, so Adam still ends up reduced to being the dumb muscle, rather than a strategic thinker. Unfortunately, Nicholas’ management skills are also kind of questionable at the moment. We see him scolding Adam for trying to kill Vicki, but where has Nicholas been for the last couple weeks? It’s up to Adam to fill Nicholas in on the latest plot development — that Barnabas has chosen Maggie to be the sacrificial victim in their Bride of Frankenstein mad science experiment, giving her “life force” so Adam’s new mate can live. Nicholas has a crush on Maggie, so he’s furious about this, but it’s a hollow moment. If Nicholas is the manipulative wizard running the show, then he should have known that they spent a good chunk of last week discussing this. Dude, you have a magic mirror that can show you anything that’s going on at the Old House. You should have been on top of this. It’s just irresponsible. But it’s not that hard for him to catch up. When Carolyn shows up, she actually apologizes to Adam for even considering that he might have strangled Vicki. This is a level of plot-mandated gullibility that actually threatens to break the show. There are three big problems with this storyline right now. I am going to enumerate them, and then I’m going to go hunt up some analgesics, because it’s only Monday and I already have a headache. Problem number one is the lack of consequences. They actually opened the week with the murder of a main character — and ten minutes later, everyone’s back to starting positions. Vicki’s not dead, and Adam’s not even being blamed for the assault. Now, I’m not complaining that Adam hurt somebody and isn’t expressing any noticeable remorse. It’s true that today’s felony places Adam squarely in the villain column, but that’s fine. Fantasy-adventure stories need villains, and villains are supposed to do villainous things. The consequences issue is that Adam basically just killed Vicki, and it hardly even registers as a plot point. There’s no investigation, no confession, and no character development; it’s just a thing that happened, and we can all forget about it. Problem number two is that we’re still stuck in Adam’s little third-floor hideout. I can hardly even remember what life was like before Adam was holed up here in this abandoned west-wing suite. This plotline hasn’t changed much in the last several weeks, and it’s giving the audience time to dwell on all the refrigerator moments. And problem number three is the women. I know that it’s odd to say, “This storyline about creating a female love-slave for a violent psychopath isn’t particularly strong on women’s issues,” but Dark Shadows isn’t just a fantasy-adventure story, where you can marginalize all the female characters and move on to the car chase. It’s also a soap opera, and soap operas are supposed to be about women, and women-related subjects like feelings and consequences. But here we are, watching an episode of daytime television that begins with strangling a woman who doesn’t struggle or even cry out, and then the rest of the time is mostly Carolyn talking to a series of men who lie to her and boss her around. This is a real problem, and it’s going to come up again. The Bride of Frankenstein story has turned into a reverse beauty pageant, where the guys get together and argue about which woman they’re going to sacrifice on the altar of mad science. This hot potato is going to be tossed around between Carolyn, Vicki and Maggie all week. Julia is the one female character in the story who actually has agency of her own, but she’s kind of sidelined too — mostly just turning the knobs and flipping the switches while the guys decide whose life force they’re going to extract. The fact that they can have this whole episode with Julia off-camera pretty much says everything. It’s going to be a rough week, folks, and I’ve already used up my Dark Shadows board game material. This might get ugly. Tomorrow: In Which I Just Can’t Even With This. In the teaser, when they cut from Vicki waking up to Barnabas in the hall, the camera on Barnabas swings wide, and it takes a second to get it under control. 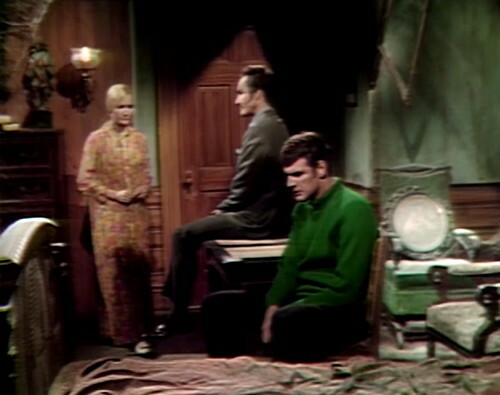 When they’re in the hall trying to get into Vicki’s room, Barnabas asks Carolyn, “Are you sure there’s no other way to get in?” Vicki’s room was actually used as Josette’s room in the later part of the 1795 storyline, and Barnabas used a secret panel to get in and out of the room a couple of times. Barnabas uses a key at Vicki’s door to push the key out of the lock on the other side. Carolyn looks at the studio for confirmation that the falling-key sound effect played, so they can go on with the scene. 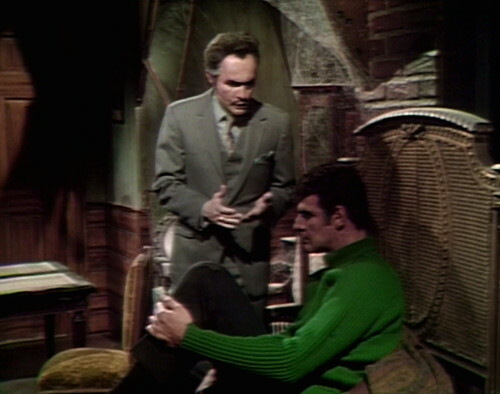 When Barnabas frets over Vicki, he keeps talking and accidentally overlaps himself, as his thinks monologue begins. Two weeks ago, Adam smashed through his door on his way out, upset over Carolyn’s rejection. Today, the door is magically fixed. I see this a lot with the work of new writers: Consequence-less scenes with no stakes and thus no tension. Every scene should either advance the plot, reveal character, and/or increase conflict. If it’s the same scene as the last one but in a different room, then you’re losing your audience. As we’ve discussed, soap operas by design can’t be as tightly plotted as novels, plays, or movies. But they flourish when there are real feelings and consequences. This episode failed in both categories. Sam Hall wrote today’s episode, but even he struggles with two major problems with this storyline and, frankly, with the modern-day Collins family in general. The latter is an ongoing issue after the series transitioned from spooky gothic soap to monster show. The writers are always keeping the Collins family in the dark — basically preserving them in the amber of 1966 pre-Barnabas. This makes them both dull and stupid. It’s like a series in which I’m constantly trying to convince you that you’re not living in San Francisco and coming up with implausible explanations for the streetcars, hills, and fog. 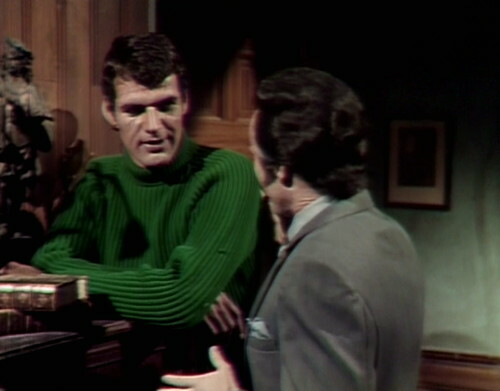 Later, after Eve is killed, Nicholas will force Barnabas and Julia to repeat the experiment by saying that he has no use for an “incomplete” monster set. He’ll kill Adam if he can’t have Eve, and killing Adam will make Barnabas a vampire again. Those are real stakes and stakes we can legitimately fear — Barnabas has been a vampire and the show can continue if he’s a vampire. Vicki’s loss only matters to Barnabas, and he “loses” her if he’s a vampire (not that he ‘had” her now) but that still intensifies things more than what we currently have. 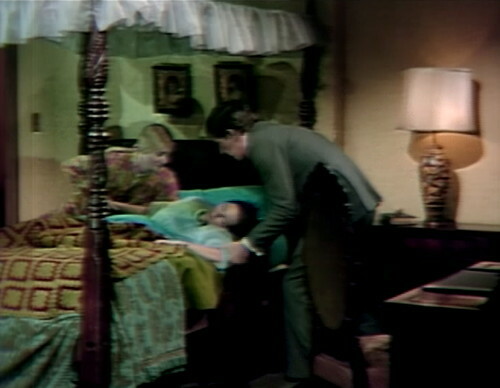 For whatever reason, the series is insistent on Nicholas not directly confronting Barnabas and Julia. It’s a weird game to play because they know he’s evil and he knows it. He’s not fooling anyone — unlike Carolyn or Roger, where such subterfuge on his part makes sense. 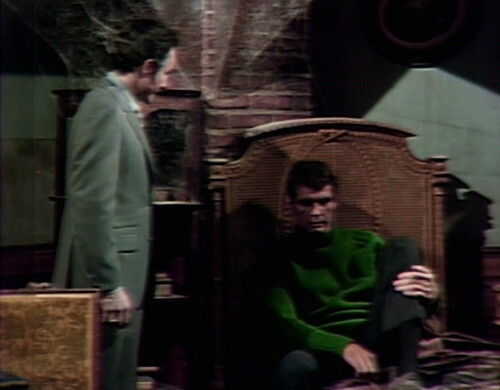 If they’d avoided this tedious “disguise,” they could just have skipped most of this storyline and just advanced to the part where the experiment is conducted for the last time — Nicholas’s “life” is one the line, as is Barnabas’s. Things matter. The writers could have benefited from watching the original BRIDE OF FRANKENSTEIN, I think. Long ago when they attempted the ‘Seaview’ storyline it appeared that Carolyn may have been thinking less than happy thoughts that Burke (who had not long ago unceremoniously dumped Carolyn) was now engaged and planning on setting up house with Vicki. The expression on Carolyn’s face when she was looking out the window at Seaview hinted as a possible storyline of jealousy and revenge. I think Carolyn harbors a secret grudge and feelings of resentment towards Vicki because Vicki seems to find men that actually love her and want to make a life with her. This would have been an interesting angle to pursue. In a couple of months when Vicki takes off into the 18th century time warp Carolyn never seems too upset about it, even though the two girls were close friends since the beginning of the show. It’s sad the show has to lose the ‘human’ factor to concentrate on stupid Adam. As I mentioned in my first post, the modern-day Collins family suffered greatly when the series transitioned to a monster show. For whatever reason, the writers decided that everyone would get along. Compare the post-Barnabas Collinses to 1795, 1897, 1840, 1970 PT or even itself in 1966. To roughly quote Tolstoy, happy families are boring as hell. Yes, Carolyn has pounds of motive to overtly hate or subtly resent Vicki — ranging from Burke to her mother’s affection for her. Choose one but either is better than what they have. All conflict between the family is frustratingly external: Cassandra puts a spell on Roger rather than Roger — a man with full possession of his sight — actually legitimately falling for her and being manipulated against the family. Cassandra puts a spell on Tony — see above. And the entire family is outright brainwashed during the Leviathans. What’s even more frustrating is that time and time again, once the dust settles, no one outside of Barnabas and Julia can ever remember what happened which seriously stumps character growth and throws potential consequences out the window. I get it, it’s a daily soap and there’s only so many changes they want to make without having to get rid of characters. But it does severely lessen the impact of storylines if all you know there’ll be a magic reset button at the end of the story. And I’m willing to bet that this did have some effect on viewership eventually. At the end of the day, you want to invest in these characters – but if they’re not moving forward what’s the point? And it’s a shame that characterization went out the window in 1968 in favour of plot twist after plot twist. I know things moved slowly in 1966, but I loved the characters and I do think they were surprisingly well rounded for a soap – well, maybe not Vicki. And yes, I know they wanted to focus on the supernatural aspects – but I think there’s a way of doing that and having consistent, evolving characterization as well. What’s strange is that the writers seem capable of doing this with the characters in 1897. The other timelines had more freedom, arguably, because you could literally burn Collinwood to the ground at the end. But 1897 was able to function like a “normal” soap opera but one where the characters had a brain in their heads and thus were aware of zombies, witches, phoenixes, and vampires. A “What If” I’ve considered is if Barnabas had never returned to modern-day Collinwood permanently. If instead of being captured by the Leviathans, he’d wound up in PT 1970 with Julia desperate to join him (as she eventually does). 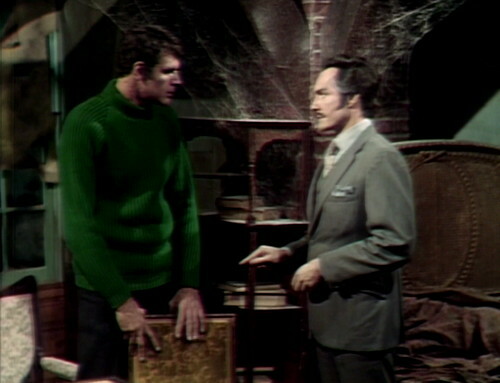 I dare say every modern-day storyline after 1967 Barnabas and with the exception of Quentin’s ghost are among the weakest. Adam has no desire to hurt Vicky, it’s the last thing he wants to do, but he has painted himself into a corner by making threats. He stands by her bed, watching her sleep, trying to convince himself that what he’s doing is necessary, fighting the guilt over what he’s about to attempt. His hands are weak with doubt and uncertainty. He’d rather find another way, but has come up empty handed, so he eventually proceeds with an unsurprisingly half-hearted attempt to strangle Vicky. Faced with the reality of what he’s doing, his rage has abandoned him when he needs it most. He fails to muster the strength to do any real harm. He has his hands around her throat, but cannot bring himself to put any strength into it. Vicky faints, allowing Adam to feel that he’s done just enough of what he set out to do, to stop and flee the scene. He’s finding that making a threat and actually carrying it out are two completely different things. A learning experience for Adam. Afterwards, Carolyn has to call the police. Like Adam, she’d rather not have to do what she is faced with, but Vicky is her friend and she can’t ignore that. Then, Nicholas Blair magically appears, and provides just enough doubt as to what just happened to satisfy Carolyn’s need for denial in regard to Adam. She has seen his good side and doesn’t want to acknowledge his dark side. Nicholas is very aware of this and uses it brilliantly, pointing out that Vicky has just broken off her engagement to Jeff. Jeff is the ex-boyfriend with the bad temper. Who do the police usually look at in these situations? It’s just enough rationalization to point Carolyn away from Adam. Then, Dr Pretorius, I mean Nicholas, goes to Adam with a better plan, much to Adam’s great relief. This is followed by a wonderful scene. 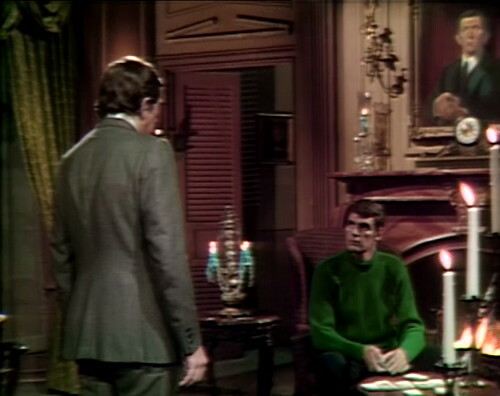 Barnabas comes home and finds Adam playing solitaire, by the fireplace. It’s not the only game he is learning. He is now able to confront Barnabas in a calm, cool and very grown up fashion, even if he is faking it, just a little bit. They discuss the situation and before you know it, a miracle happens: Barnabas sits down! OMG! Barnabas IS capable of showing Adam a little respect, how did that happen? 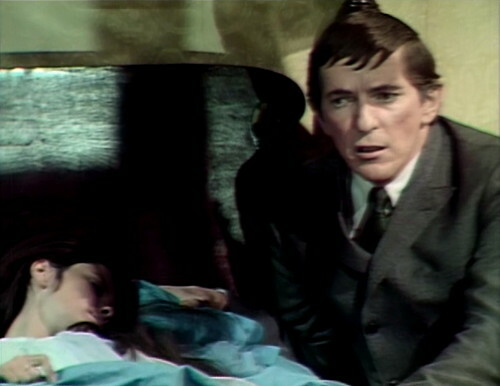 It doesn’t last long, Barnabas’s impatience has him back on his feet before you know it, and then, Adam drops his bomb: He wants Carolyn for the life force. Cue the music. No, wait! It can’t be over, I want more! I’m so engrossed! Do I really have to wait 23 1/2 hours to see what happens next? I can’t disagree with anyone’s analysis about the weaknesses of 1968, the modern Collins family or this particular episode, yet somehow I’m enjoying it. For whatever reason, Robert Rodan as Adam is still selling it for me. I was prepared to dislike the Adam storyline, but I’ve liked it. And whatever faults lie in it, Barnabas’ affinity for Victoria, Nicholas’ for Maggie and Adam’s for Carolyn does create an interesting “Good”/Bad/Ugly complex triangle of competing interactions and agendas. (Though I agree it really diminishes the gals — seems like the three of them could straighten all of this out with one good meet-up and conversation). Maybe the silver lining of The Dream Curse is that everything seems better in comparison! A blooper with the closed captioning version of this episode (I was watching the streaming version on Amazon – the discs haven’t had any closed captioning that I’ve seen), when Nicholas Blair says “Much more polite than the local gendarme”, the caption has gendarme replaced with “Gorgons”. 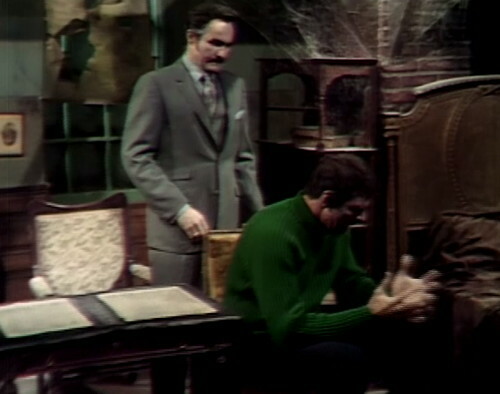 Which is a perfectly reasonable mistake to make, given that this is Dark Shadows. How does Adam come in through the window when Vicki’s room is on the second floor? You aren’t supposed to notice that! I loved Adam’s transformation (after a remedial pep-talk by Nicholas) when he showed up at the Old House calmly playing cards and with the slick superiority of a Bond villain. I remember the boy way back when he was spouting lines like “Adam eat food!”.